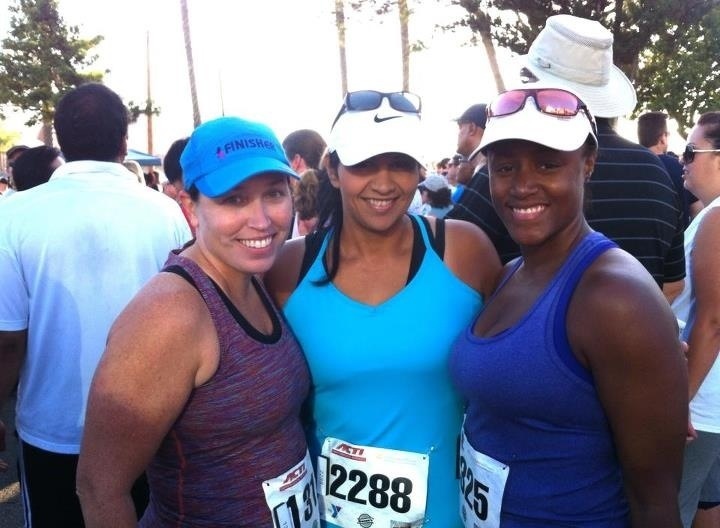 I’ve done nine half-marathons since 2006, and never trained for them. The most I ever ran was 5…6…and 7(once) miles. When I set out from the starting line I always felt great. It was always around mile 5 or 6 I would slowly start dying. Crossing the finish line is what kept me addicted. It was that feeling of extreme excitement that I finished in spite of my near death experience. Every finish I would promise myself that I would TRAIN for my next one. A promise I never kept. Ever since I joined Team in Training my life seems just a bit different. I’ve learned several things about myself and other people. Coming from a five year heartbreak I had felt disillusioned about kindness of people. This year I just knew something was going to be different. But I had no idea that Team in Training, TNT, was going to be that something. I was a bit nervous to join because I was going to have to raise money. And I’m a horrible salesperson. Filled with self-doubt before I even signed on the dotted line…I asked myself could it really be possible? -Now I know what to do when I see others fundraising! Today we went for a long run. And I started out with some people around the same pace. One fell back and a coach stayed with her. Me and another teammate kept on. Got to the turnaround point and started back. After a while, I started to lose steam. And I could tell my teammate had the energy to go faster and I told him to go. He didn’t. At least for a while. Finally he agreed to go and it was just me with my team scattered all up and down the bike path. After a while…A thought floated across my mind: “just walk.”. I was on 3/1 intervals so my other part of my brain said to me: “you CAN walk….after this three minutes is up”. I could feel myself slowing down. And then suddenly another mentor/coach ran up alongside me. “How you doing Renee?”. And instead of my normal lie of “I’m good!”, I said “I’m tired”. She gave me some energy blocks. Watermelon flavor. Not bad!! And she stayed with me. For the last mile. And talked to me about nutrition before runs, during runs, and what she likes and what she doesn’t like. Before I knew it we were at the finish. I HAD DONE A DOUBLE DIGIT RUN!!!!!! Ten miles, how sweet it feels to say that. I have lost myself into something bigger than myself. And this time, that something bigger is TNT. And the more I lose myself into TNT, the more energy I have. The more energy I have, the farther I go. The farther I go, the longer I run. 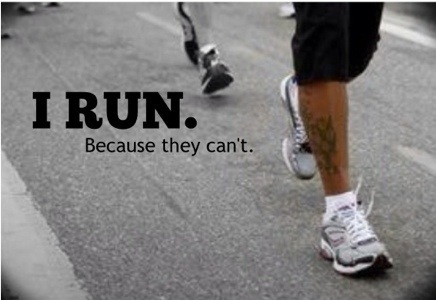 The longer I run, the happier I become. And the happier I become….the more I become my own friend. 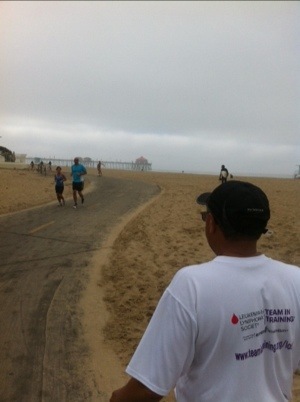 Me and my pacer almost to the Huntington Beach Pier. I had never run that far one way!!!! Thank you Team in Training for giving back to what was once given to you. I shall do the same.